Dr. Michlin was an answer to my prayers! After being hit by a semi-truck, I tried getting treatment from two other doctors with no success and continued to have severe headaches, neck and back pain. After viewing an episode of "The Doctors," I went online to see if an Atlas Orthogonist was in our area. Lucky for me that I found Dr. Michlin! His holistic approach and specialized treatments have been the miracle I needed to regain my health and get me back in top shape. I am now in a state of relief and have regained full function. Thank you, Dr. Michlin! 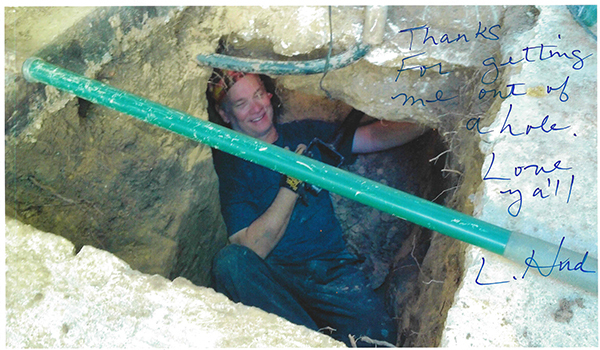 A 69 year old man, who has been suffering with sciatica, said to Dr. Michlin, "When I found your number, it was like finding a gold mine!" Give us a call and you can strike gold too! 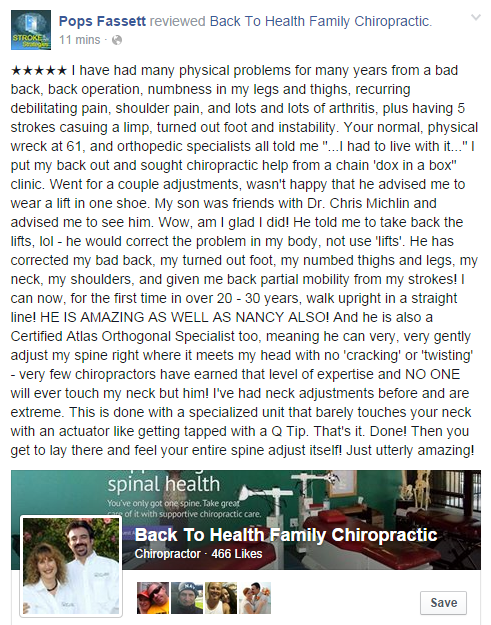 Dr. Michlin has corrected a long-standing back problem, with far more expertise and professionalism than any other chiropractor I have been to, from Cornwall, Ontario, to Watertown, NY to Fort Worth, TX. He knew exactly what to do to adjust my back and it feels great! Just three weeks ago, I was in total pain from severe sciatica and could barely hobble. He even corrected my right upper thigh that had been severely numb since I was 30 (that’s 32 years of numbness). Then, through his Atlas Orthogonal expertise, he adjusted my atlas. Just resting on the table, I could feel the joints in my spine realign by themselves! His care has been tremendous and he should be in Hollywood getting the big bucks or working with the NFL Cowboys. There are only 300 chiropractors in the world who are Board Certified Atlas Orthogonists! We are so darn lucky to have him here! He is absolutely wonderful, and I've been to several. He's not a Crack-Your-Back high volume adjuster. He schedules you to have the time to see you and treat you properly! He truly lives up to the name of Master Craftsman! My name is on here. Tell him I sent ya! At the next visit, Dr. Michlin showed me the analyzed X-ray photos. I was shocked to see that my atlas was tilted and several vertebrae were compressed, which put pressure on lower back nerves. The rest of my spinal column was shifting to compensate for this offset. As this was pointed out, we discussed treatment plans. One thing I can say about the Doc is that he is truly flexible and understanding with regard to appointments. He really made me feel confident that I was in good hands. I am also appreciative of the fact that he is gentle with the adjustments, yet he can really get things moving around if he needs to do so. I coach several sports at our school, and consider myself to be a fairly stout guy at 6 feet, one inch tall and 210 pounds. Dr. Michlin has no problems adjusting me effectively, but gently. I have been seeing Dr. Michlin for approximately seven months now. Throughout the treatment sessions, I've had the chance to get initial treatment, participate in maintenance sessions to ensure the correct alignment of my spinal column, and receive bi-weekly evaluations to assess the healing process of my back.